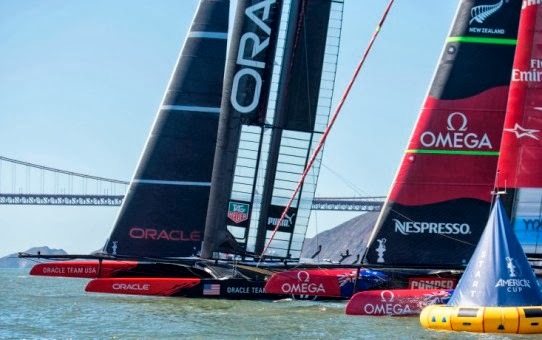 It was the biggest come back in the Americas Cup history, trailing from 8 - 1 down, defender Oracle Team USA battled all odds, and kept the sports oldest trophy in San Francisco. At some point during this final with such a big advantage for Emirates Team New Zealand, my thinking was that the challenger played cat and mouse with the defender, but for sure now I can say this was the opposite. The Americas Cup is all about boat speed, and Oracle Team USA had more in all parts of the course. Having followed a lot the cup since 2000, I was personally less intrigued by the 34th edition of the cup, the challenger series i.e. Luis Vuitton Cup was nothing compared to what we had in 2000, 2003 and 2007 with only three teams competing France Artemis, Italian Luna Rossa and Emirates Team New Zealand. These two battled it in the challengers final with Emirates Team New Zealand winning 7 - 1 over Luna Rossa Challenge. Speed nowadays is king but I still was not fully amazed by the catamarans. While the boat speed they managed was impressive in anyone's critic, my opinion is that they take a lot from what real sailing is all about. Give me the old now slow AC series from a few years back! Do you remember Torben Grael and his wind finding skills. While going back to the AC series is next to impossible, they are a thing of the past, may be something in between can be found such as a concept going close to fast mono hulls as the VOR series. Looking much in the past at match point the Kiwi's declared a return to mono hulls, which seems to have excited a huge part of the yachting community. But will the defender give up such a huge advantage. The World oldest trophy the 100 Pound Cup also known as the Americas Cup have always shown us it will not.